Our childhood sets the stage for us into adulthood. If I Weren't With You by Rosie Pova is a beautiful children’s story about what life would be like without the love and protection between a child and his mother. Walk through the forest while Mama and Baby Bear share elements of love and bonding, as Baby Bear inquires as to what would his mother do if he wasn’t around? You can tell that the questions Baby Bear asks display a feeling of of uncertainty and the lack of security, but the answers that Mama Bear provides give Baby Bear the reassurance that his mother loves him unconditionally. If you read this book with your child, you will feel the love and comfort that can set the stage for a lasting and bonding connection between you and your child. 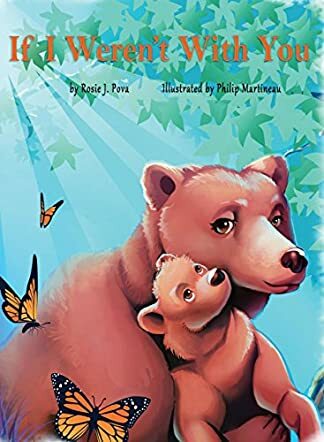 Author Rosie Pova is a mother who sees herself as a Mama Bear to her own three children. This story provides such a solid and beautiful example of how important the bond is between a parent and child. Children need to feel secure and to know that they have someone that they can depend and count upon. Rosie Pova does a great job in telling the story, along with the beautiful and colorful illustrations by Philip Martineau. This collaboration helps to set the stage for how, as a parent, listening intently to your child and giving them the assurance that you love and care about them is important to their development, comfort and growth. I am sure that this book will become one of your child’s favorite stories.